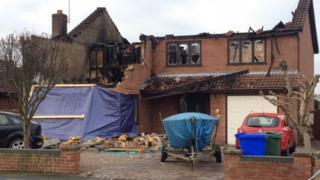 One of three people found dead after a house fire in Lincolnshire had been stabbed, an inquest has heard. Emergency services were called to the property in Pear Tree Road, Kirton, near Boston on New Years Day. The bodies of Billy Hicks, 24, Jay Edmunds, 27 and Ashley Martin, 32 were found inside the burnt out property. Boston Coroner's Court was told that Mr Hicks had suffered a knife wound to his heart. The inquest was told that if Mr Martin had survived he would have been arrested on suspicion of murder. Two other women in the house were taken to hospital after they escaped the blaze, which the court was told was believed to have been started deliberately.